360 needs to move on. I really don't think all of firday's show should have been about Michael Jackson. If all of monday's is about then then there's something wrong. 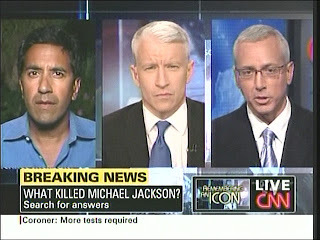 The only good part of the show was Anderson talking to Dr.Drew and Dr.Gupta. I think that's the first time AC has spoken to them at the same time. I really really like Dr.Drew and I like Dr.Gupta so both of them on there was nice. Hopefully next week 360 will move on and if we're really lucky we'll get to see Anderson's interview with Roxana Saberi. I won't hold my breath on that one, but I do hope one day we'll get to see it. I think its going to be a really good interview. Lets keeps our fingers crossed we get to see it next week. YAY! Anderson on R&K! I love when he's on there. Its always nice to see his lighter side. Thanks for posting The Shot. I had a good laugh watching the Andergiggles and the banging of the head on the table. Erica's mention of "Jazz Hands" is what set him off. He's so adorable. Thanks also for informing us on him hosting R&K, I'm looking forward to it. Sapphire, great post - I share your sentiments about Michael Jackson, Farrah Fawcett and Ed McMahon - they were a large part of my life and memories. 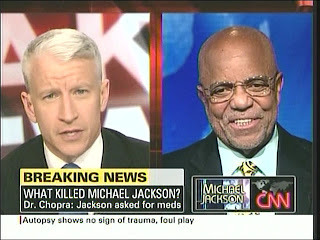 I loved Anderson's interview with Berry Gordy - he rarely makes appearances and I still find him a fascinating figure. The racial discussion was a good one although I think the guest Jehmu Greene backed away too quickly from the idea of Jackson deliberately changing his appearance to look more white - I do think he had some issues with his race - all of the Jackson's have had some form of plastic surgery, but obviously Michael took it to an extreme for reasons that I believe are pretty sad. Anderson doing a headdesk and giggling over the jazz hands prisoner was a nice way to end a week of 360 - I can't help but laugh when AC has one of his periodic giggle fits. Happy to see AC making his third appearance this month on R&K and the guest Kristiana DeBarge is the daughter of James DeBarge who was once married to Janet Jackson. Love when Anderson's on R&K. Can't wait. 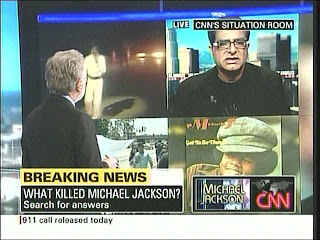 Unlike some, I do not resent the wall to wall coverage of the death of Michael Jackson. First, unlike the passing of Farrah Fawcett, another American icon, Michael’s death was completely unexpected and shocking. That’s “news” in the classic sense. Second, because his immense contribution to American culture is not only unique and lasting, his absolutely unique persona and personal history over the last 40 years has kept at least two generations, and much of the rest of the world, mesmerized and transfixed. Books will be written for decades about Michael Jackson, his contribution, his tragedy and triumph. People do not know, and now can never really know all that they would wish to know about Michael Jackson. Like Elvis Presley, he will remain part of American culture in death. The passing of such a person, expected or not, deserves attention, and is news. And, who better to bring us news of the life and death of a cultural icon than . . .another cultural icon? Ladies and gentlemen, may I reintroduce to you one of the world’s most beautiful reminders of why most of US don’t work in television . .Mr. 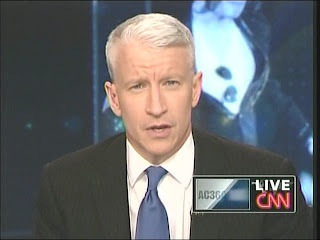 Anderson Cooper! On a terrace in Paris along Avenue des Champs-Élysées; on a roof top in Hollywood, the setting sun kissing his silver head with golden light; or sitting at his kidney-shaped pool of a desk in the New York studio, looking perfect beyond all reasonable expectation – any Anderson is better that anyone else. Deny it if you must; you and I know you’d be kidding yourself. Too long gone, thankfully he came back just in time to cover a story he is uniquely qualified to cover. Studio 54 at 10? Did you see his expression on Thursday night during Sheryl Crowe’s lengthy recollection of her days as Michael’s lead female singer? He grew up with Michael’s music, as did many of you. Michael’s death was personal, in more ways than one, and it shows. That’s the kind of reporting Anderson is best at, and these last two nights have been mesmerizing. Monday it’s back to the real world – gritty, violent, tragic, sleazy, boring, petty. More on Sanford’s fall from . . . .the pedestal he placed himself upon; more on Iran’s democratic convulsions; more breast beating about Obama being a closet conservative. Anderson will be beautiful, but less scintillating. 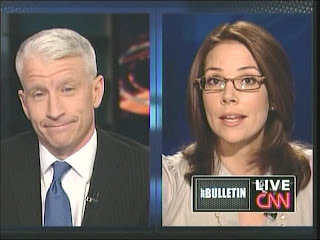 The guests will be familiar – having been on air without break since the Situation Room with Wolf Blitzer. Erica will be little in evidence but, when she is, will play her role a foil and straight man to our star. I kinda grew up Michael Jackson but grew to not be a fan. However, I do feel he deserves some attention for the barriers he broke down. I don't mind hearing new things about what's happening with him but I don't like it when they rehash things over and over. Anyway, I hope his kids are able to have some sort of normal life at this point. I enjoyed the show last night -- although, I'm looking forward to getting back to a wider variety of stories next week. 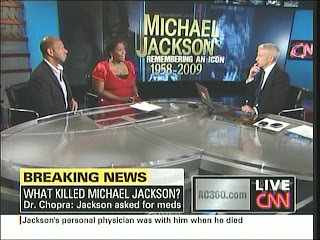 With the initial medical examiner's report coming out yesterday and the amount of time being spent on this story on all news networks -- I wasn't surprised to see the whole hour devoted to MJ -- look at the reaction on the AC360 blogs on their website -- it's obvious this story is important to many people. @ACAnderFan -- I received a response yesterday that the Roxana Saberi intterview will air next week. They didn't say which day, but that it will definitely air. Since CNN sent Anderson to Paris specifically for the interview, I do believe it will be aired. And with everything still going on in Iran, it will still be timely next week. Thanks, Sapphire for posting The Shot -- I always laugh when Anderson bangs his head on the desk after a fit of the giggles -- good ending for a Friday. Also, Sapphire -- thanks for the heads up on the Regis and Kelly appearance. @Lori,IL thanks for that info. Glad to hear that it will air next week. @M in Oregon, I think the coverage is excessive. Every time you put it on CNN they're still taking about him. I don't even remember this amount of coverage when Frank Sinatra died and he was a true music legend. I just think CNN has a tendency to go way overboard on some things. I believe a lot of people will find closure during all this televised coverage, seeing that Michael Jackson’s death was quite sudden. Maybe it’ll help with the healing process. I only saw the last bit, The Shot, but it was very good, lol! Loved the Andergiggles! Always great to hear that he will be co-hosting R&K! 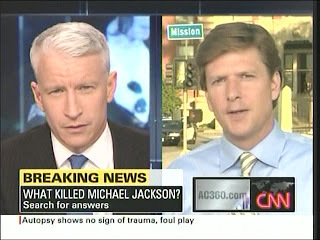 I can't say I have been a fan of MJ, but I do think CNN and AC360 have done a great job covering his life and death. It has been good seeing some of the songs that he had sang. I LOVE when Anderson was beating his head on the desk when they were playing the video of the prisoners. After all the sad news last week it was nice to have some laughs at his expense on a Friday night. I do hope we do get the interview next week. As someone said, they paid for Anderson to go all the way to Paris, so I am sure they will still show it. Hope all have a great weekend.